Ned Resnikoff wrote a fascinating article about New Atheism, Dawkins’s brand of atheism. Resnikoff recalls Nietzsche’s parable of the madman in The Gay Science. In the parable, a village madman announces that “God is dead.” He discovers, however, that others—including atheists—don’t understand what getting rid of God truly entails. If you’re unfamiliar with the parable, I found a great three-minute video for you. 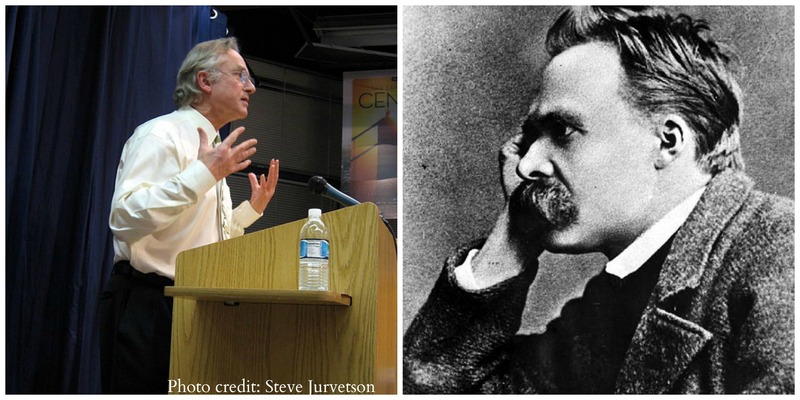 Ravi Zacharias reads Nietzsche’s parable, while relevant images accompany the words. As Nietzsche wrote, “Who gave us the sponge to wipe away the entire horizon?” For Nietzsche, God’s absence has dramatic consequences for how we make sense of the world and ourselves. The village atheists of Nietzsche’s parable are smug, frivolous, and wholly indifferent to the implications of their espoused worldview. In other words, they’re not all that different from the self-appointed spokespeople for what’s referred to as New Atheism. Dawkins’s problem is that, much like the atheists in Nietzsche’s parable, he fails to take God’s absence seriously. Instead, he seems content to applaud himself and his acolytes for being the smart kids. Whereas the death of God was the starting point for a very long line of inquiry for Nietzsche, it’s the end of a very short one for Dawkins. Thus while Dawkins may have excised God from his vocabulary, he’s only replaced it with a form of deracinated, unreflective, godless Christianism. Platonic epistemology, moral realism, and a sort of blind confidence in the inevitability of human progress all figure heavily into Dawkins’s worldview; the only thing missing is the big guy in the clouds who helped make these concepts intelligible. Unlike Dawkins, a pretty consistent atheist is Alex Rosenberg, chair of Duke’s philosophy department and author of The Atheist’s Guide to Reality. My point here, through the use of absurd humor, is that the view of Scripture that serves as the basis for Ham’s ever-ready denunciations of those who disagree with him on matters of science, etc. is a view that Scripture itself cannot bear. If you aren’t familiar with Enns’s books, I recommend reading them. The Evolution of Adam and Inspiration and Incarnation are fantastic. He also has a new book coming out September 9th, The Bible Tells Me So: Why Defending Scripture Has Made Us Unable to Read It. Have you ever thought academics should make rad movie trailers for their dense papers? Then today is your lucky day. Physicist Sean Carroll found a great trailer for an intense paper, “Inflation in Supergravity with a Single Chiral Superfield.” (Whatever that means.) Check out the short trailer, made with iMovie. My favorite part is the hero shot of one of the authors, toward the end of the video. On a related note, if you haven’t seen the Thomas Kuhn trailer, check it out now. Hopefully these kinds of videos become a trend. I’m looking at you, Russell Johnson and Ray Barfield. “I’m a Christian myself and had to play an atheist. I see the anger of these (atheist) guys on TV and it’s like ‘wow, how do you get so angry at something you don’t believe in?” said Sorbo. Furthermore, the actor said he is not fond of how atheists have a say in Christian traditions like Christmas. “It’s funny how they can get nativity scenes pulled down because they say it offends them but they’re offended by something they don’t believe in. What offends 90 percent of the country is that they take down nativity scenes but apparently the majority doesn’t have a voice in the country anymore so what are you going to do?” said Sorbo. What do you make of Sorbo’s comments? If you saw God’s Not Dead, what did you think of it?